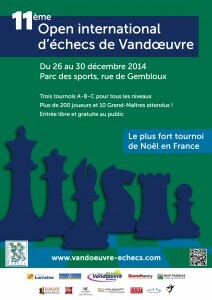 The 11th International Chess Tournament Vandoeuvre 2014 was held on 26-30th December 2014 in the Hall of sports, Str. Gembloux, in Vandoeuvre-lès-Nancy, France. The strongest Christmas chess tournament gathered players from 12 different countries. The Master Section was a 9-round Swiss tournament with first prize in the amount of 1.500 €. IM Dennis Wagner and GM Sergey Fedorchuk tied for the first with 7/9 points, but Wagner prevailed on a superior tie-break score and took the gold. GM Tigran Gharamian finished clear third with 6.5 points, while IM/WGM Anastasia Savina finished in sixth place with 6 points and took the best female prize.